Spring was a Man in New York is the third chapter of Vicky Sabourin’s ongoing project, Becoming Invisible. Taking over the gallery as her studio for two weeks, Sabourin will conduct a casting call to find the perfect double of a fleeting glimpse of a stranger she encountered in New York years ago—a man who threw pinecones over fences, in a gesture that seemed intentional and performative, but the purpose of which was ultimately unknown—a double for the artist. 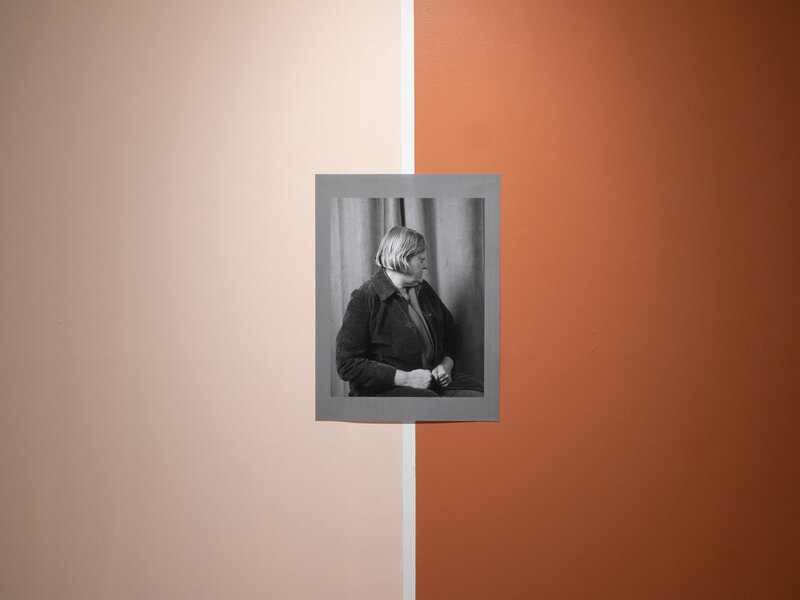 From this on-site work, Spring was a Man in New York will ultimately result in an installation including 8x10 headshots, records of her interactions with the actors, and larger photographic works. Download the Casting Call to participate in this new project. At Latitude 53, this new project will be presented alongside the two previous parts of the series, which deal with anxiety and loss. Becoming Invisible (I) is a video installation of the artist attempting to connect with a felted falcon, in an absurd and futile gesture towards an artificially constructed “nature”. The video makes particular attention to a falsified foley soundtrack, in a way a re-performance much like the actors’ in part III. 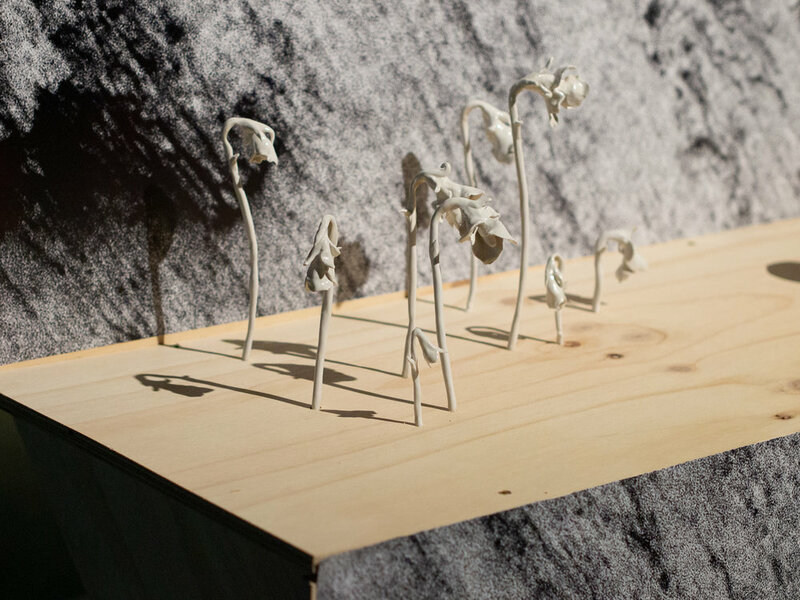 Chapter Two, The Absent Mountain is my Aching Phantom Limb, was presented in 2018 as a public sculpture, a transitory text-work originally developed as a site-specific reference to the artist’s sudden experience of the flat landscape of Saskatchewan. A new version of this work will be presented here, again in Western Canada, with a new relationship to Edmonton as well as to the in-gallery elements of the other two chapters. This work will be visible from the streets of Downtown Edmonton through the large windows of the Enbridge Centre (10175 101 Street, facing onto the pedestrian boulevard on Rice Howard Way), as a work that is intended to see the sun and the public outside of the gallery. Read the exhibition text by Kalie Stieda. Vicky Sabourin lives and works in Montreal. She holds a master’s degree in visual arts from Concordia University. Her work has been presented in art galleries, museums and artist-run centres in Canada, the United States, and Europe. Recent solo exhibitions of her work include Les Curiosités at the Musée national des beaux-arts du Québec (MNBAQ), Danse Macabre at L’Oeil de Poisson in Quebec city and at Sporobole in Sherbrooke. Warmblood has been exhibited across the country; from Eastern Edge Gallery in St John’s Newfoundland, Struts Gallery in New Brunswick, the Hamilton Artists Inc in Ontario to Access Gallery in Vancouver. Sabourin’s piece “Lac caché” was part of the event Manif d’art 8, Biennale d’art contemporain du Québec, presented at the MNBAQ. In December 2014 she was named emerging artist of the year by the newspaper La Presse and was a finalist for the Pierre Ayot Award. She is a recipient of grants from the Conseil des Arts et des Lettres du Québec and the Canada Council for the Arts.